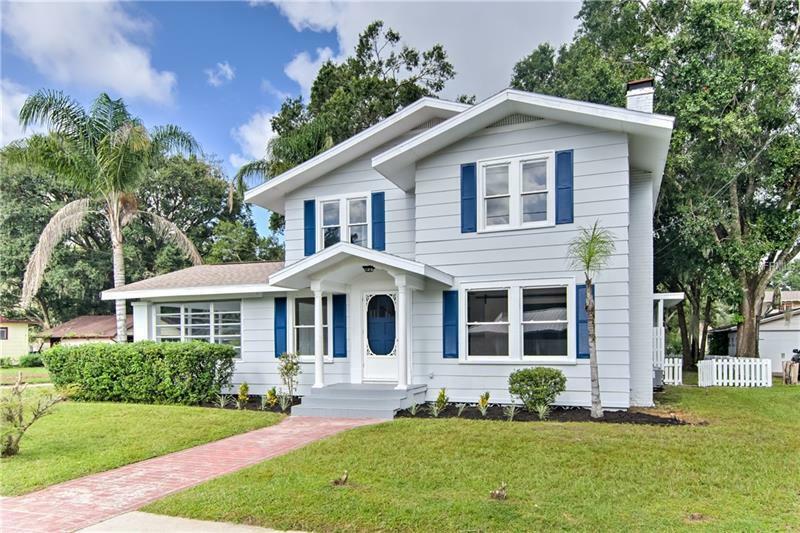 Enchanting, gracious and transcendent describes this 1920's historic home in the heart of Plant City. A brick road leads you to this classic gem on a beautiful corner lot with attractive landscaping. Built in 1926, this home has 4 bedrooms, 3 full bathrooms and 2675 square feet. As you walk through the front door you will see all the original-restored trim, doors and oak wood floors. An updated fireplace, custom made barn doors and a sun room are a few of the charming features that make this house so special. A modern kitchen features ceramic/glass tile back splash, granite counter tops and 42" Shaker cabinets, making the home feel bright and delightful. The staircase has the original, hand carved railing and the antique oak wood floors continue on the second floor. All upstairs bedrooms have brand new carpet and fresh paint. The master bathroom has been completely updated with a walk-in shower, huge closet and stunning granite counter top. The upstairs main bathroom highlights a 100-year-old Kohler "USA" stamped claw foot tub and cedar wood trim. Not only is the interior of this house restored, but the exterior as well. The back door will lead you to a large deck that has been beautifully painted. A detached 2 car garage with an air conditioned multi-purpose room attached sits a few feet away from the home. You will be minutes away from downtown Plant City, I-4 and I-75. Being between Orlando and Tampa makes this location very desirable, along with the many attractions Plant City has to offer.